What is the UCI BRoAD Lab? The UCI Biobehavioral Research on Adolescent Development (BRoAD) Lab is a collaborative team of scientists, research staff, and students from multiple disciplines at the University of California, Irvine. Our aim is to learn more about adolescent mental and physical health, behavior, and development. The Lead Researcher of the BRoAD Lab is Dr. Uma Rao, the Vice Chair of Child and Adolescent Psychiatry at the UCI School of Medicine and the Director of Education and Research in Psychiatry at Children’s Hospital of Orange County (CHOC; see Dr. Rao’s Faculty Profile). All of our research studies are supported by grants from the National Institutes of Health. Our research studies focus on adolescence because it is a period of learning and adjustment, particularly for setting long-term goals and personal aspirations. 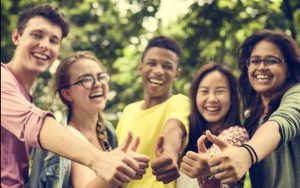 Youth discover how to navigate new social challenges and adjust to many physical, cognitive, and emotional changes, and significant structural and functional brain changes accompany these complex developmental processes. Adolescents develop flexible problem-solving abilities and experience heightened reward sensitivity. They also become more willing to take risks, more concerned with both themselves and others, and they become more aware of and concerned with their social status. All of these changes can lead to either positive or negative growth trajectories as youth transition from adolescence to young adulthood. Examples of positive growth trajectories include adaptive exploration, developing mature long-term goals and developing social competence. Negative growth trajectories include diminished goals, depression, social withdrawal, and excessive motivation toward negative goals such as substance use and excessive risk-taking. We are interested in learning more about what influences these trajectories so that we can help inform social policy, and provide doctors and parents with additional tools and guidance to promote a positive future for their adolescent children. Copyright © 2019 Biobehavioral Research on Adolescent Development (BRoAD) Lab. Powered by WordPress. Theme: Spacious by ThemeGrill.